It's that time of year folks. Time to get your kids all prettied up and to the fields early, only for them to have erased all your hard work and get dirty prior to individual and team photos. 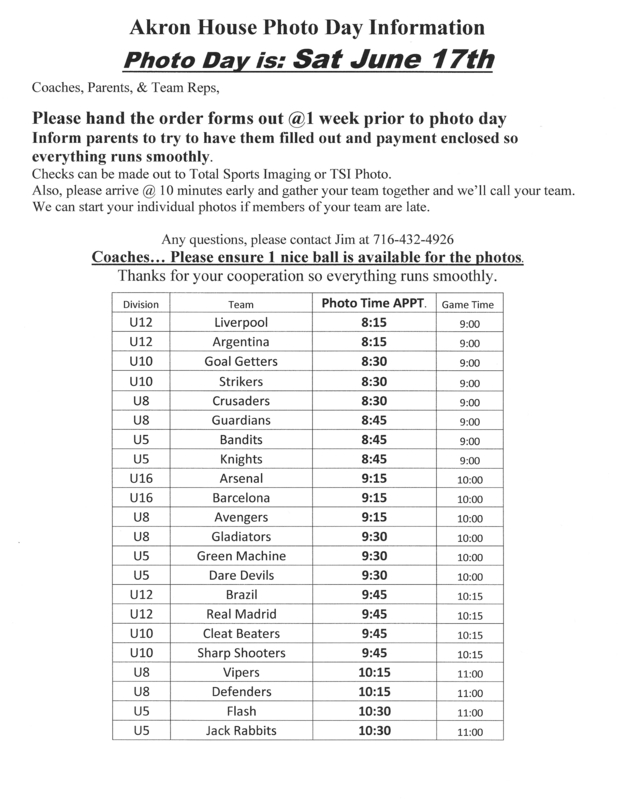 Please see the schedule and make note of what time you are required to get pictures done. Allow 15 minutes prior to your start time for filling out forms, finding your coaches and getting lined up. Just a reminder that if you purchase photos, the league does get a stipend that helps with year to year costs, which is greatly appreciated. If you are unable or decide to decline purchasing photos, please make every effort to still come and have your child sit for the team photo. The rest of the team appreciates your extra effort. Thank you Akron Soccer League families for all that you do.